Gooding will offer at least nine Maseratis at the 2016 Pebble Beach Auctions including an A6G/54 Spider, Ghibli 4.9 SS Spider and a 5000 GT Indianapolis Coupe. 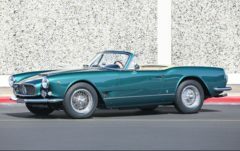 Five of the Maseratis are from a single renowned collection that included a 1962 Maserati 3500 GT that belonged to Eddie Fisher, Elizabeth Taylor and Anthony Quinn. However, the top results are expected from the 1957 Maserati A6G/54 Spider (Estimate Available Upon Request), 1971 Maserati Ghibli 4.9 SS Spider (Estimate: $1,750,000-$2,250,000) and 1961 Maserati 5000 GT Indianapolis Coupe (Estimate: $1,500,000-$2,000,000). Gooding & Company, the official auction house of the Pebble Beach Concours d’Elegance®, is holding its Pebble Beach Auctions on August 20 and August 21, 2016, at the Pebble Beach Equestrian Center. 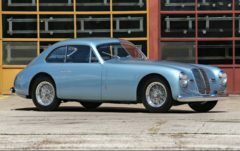 Ferraris are usually the attention grabbing cars at the annual Monterey classic car week and although the top prices are likely to come for Ferraris again in 2016, Gooding will have further Italian postwar classics on offer with the nine Maseratis drawing attention. Maserati built just 34 examples of the 5000 GT between 1960 and 1965, with eight Italian coachbuilders supplying their own distinct designs for the chassis. 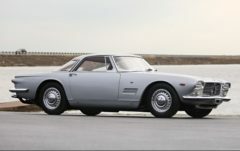 Regarded as a “Car of Kings,” the 5000 GT was the fastest road-going automobile of its day, with its fuel-injected, four-cam V-8 engine derived from the legendary 450S sports racing car. The 1961 Maserati 5000 GT Indianapolis Coupe, chassis AM103.014, (Estimate: $1,500,000-$2,000,000) was the first of 22 examples to receive elegant Coupe coachwork by Carrozzeria Allemano. This one-off “Indianapolis” coupe was featured in the Maserati 100th Anniversary Exhibit in Modena and has been conscientiously restored to the original factory colors of Grigio Montebello over red leather upholstery. The Maserati 3500 GT Spider features fashionable coachwork by Carrozzeria Vignale and is among the most desirable drop-top sports cars of the early 1960s. A worthy rival to the contemporary offerings from Aston Martin, Ferrari and Mercedes-Benz, Maserati built just 242 of the 3500 GT Vignale Spiders. The 1960 Maserati 3500 GT Spider, chassis AM101.775, (Estimate: $900,000-$1,200,000) is one of the early “pre-series” cars, with unique features and its original Peacock Green livery. It is undoubtedly one of the finest examples to appear for public sale in recent years. The introduction of the A6/1500 ushered in a new era for Maserati, as it was the company’s first true production car, with 61 examples built and 59 bodied in elegant aluminum coachwork by Pinin Farina. This 1948 Maserati A6/1500 Coupe, chassis 060, (Estimate: $800,000-$1,100,000) features a rare factory three-carburetor setup and has an exceptional racing history, winning its class at the Monza Coppa Inter-Europa in 1949 and 1950. For the collector in search of a vintage Maserati that is eligible for the most prestigious international concours and rally events, chassis 060 represents a rare opportunity to own one of the best. The 1962 Maserati 3500 GT, chassis AM101.2102, (Estimate: $400,000-$500,000) offers a Hollywood provenance to three icons – Eddie Fisher, Elizabeth Taylor and Anthony Quinn. In January 1962, Eddie Fisher purchased this 3500 GT Coupe as a gift for his wife, Elizabeth Taylor. Taylor barely drove the car, so Fisher sold it to friend and car enthusiast, Anthony Quinn, who brought the Maserati to his home in Beverly Hills. Upon learning of the 3500 GT’s early history, the current owner undertook a concours-quality restoration, returning the car to its original glory. This Maserati 3500 GT Coupe is one of the most magnificent examples to behold. Delivered with extensive documentation and celebrity provenance, this is an opportunity to own a piece of Hollywood and Maserati history. Maserati built just 27 Ghibli Open Cup cars to compete in the 1995 Ghibli Open Cup Championship. This 1995 Maserati Ghibli Open Cup, chassis 361220, (Estimate: $60,000-$80,000) was the 11th car built. In its car nine races it took first place in the professional class and second overall in the series at the hands of Federico D’Amore. The car has been upgraded with Maserati’s “evolution kit” and is ready to clip apexes at the next owner’s favorite track and club events. The A6G/54 is widely regarded as the most desirable Maserati grand touring car of the 1950s, with a brilliant race-bred chassis and exotic twin-cam six-cylinder engine. Just 10 of these important Maseratis received coachwork by Pietro Frua, a master of the coachbuilder’s art, whose designs for the A6G/54 are characterized by their contrasting central stripe and exceptional attention to detail. The 1957 Maserati A6G/54 Spider with Frua coachwork, chassis 2191, (Estimate Available Upon Request) was built in March 1957 and is one of only two originally finished in Ivory. 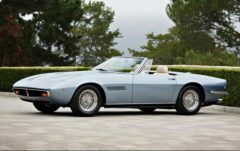 Sold new through Charles Rezzaghi Motors in San Francisco, the Frua Spider remained on the West Coast until it was eventually discovered in the late 1980s by noted Maserati collector Frank Mandarano. In the early 1990s, this car joined the famed Alfredo Brener collection of custom-bodied Maseratis and was restored under his ownership. A significant coachbuilt Maserati, this A6G/54 Frua Spider retains its original engine and will be an ideal entry into a wide variety of exclusive rallies and concours events. Sculpted by Ghia’s head stylist Giorgetto Giugiaro, the Ghibli 4.9 SS Spider was hailed as the one of Italy’s most thrilling new designs. 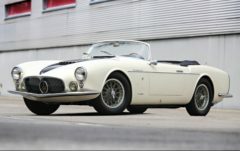 The company backed up the Ghibli Spider’s good looks with a four-cam aluminum V-8 capable of a top speed of 170 mph, making this car one of the fastest production vehicles available at the time. This 1971 Maserati Ghibli 4.9 SS Spider, chassis AM115S/49.1237, (Estimate: $1,750,000-$2,250,000) is one of only 24 examples shipped to the US with the five-speed ZF gearbox. After an extensive five-year restoration in 2009 by marque specialist, Martin Logé, the car went on to win a Best of Marque award at Concorso Italiano in 2014 and a Best in Class award at the Greystone Mansion Concours d’Elegance in 2015. The car is presented today in show-quality condition with a rare factory hardtop, fitted luggage, correct tool kit, as well as other factory literature. Maserati enlisted Vignale’s Giovanni Michelotti to create the stunning Maserati Sebring Series I, a perfect marriage of the proven Maserati’s 3500 GT with a stylish new body. The 1963 Maserati Sebring Series I, chassis AM101.01563, (Estimate: $350,000-$425,000) offers full factory documentation, a known history and a handsome original color scheme that highlights the subtlety of Michelotti’s genius. A purist’s delight of the venerable, the 1960 Maserati 3500 GT, chassis AM101.930, (Estimate: $250,000-$325,000) has been exceptionally maintained and preserved. The car has been Maserati Classiche certified with matching-numbers engine and presents beautifully with its original black leather upholstery and the original cream livery.